At the Youth Speaks event, organised by Hythe & Waterside Rotary Bethany Longworth , Molly Blay and Molly Smith from Applemore talked on their chosen subject Should Children be Allowed Mobile Phones, in the intermediate group.They were followed by Noadswood students Sophie Boyes, Ellen Cole Bailey and James Semmens in the senior group speaking on The Green Revolution. They had to talk on their subject in front of a panel of judges fighting off stiff competition from other schools. They now go on to the next round covering the whole of Hampshire at The John Hanson School Andover on 7 th March. 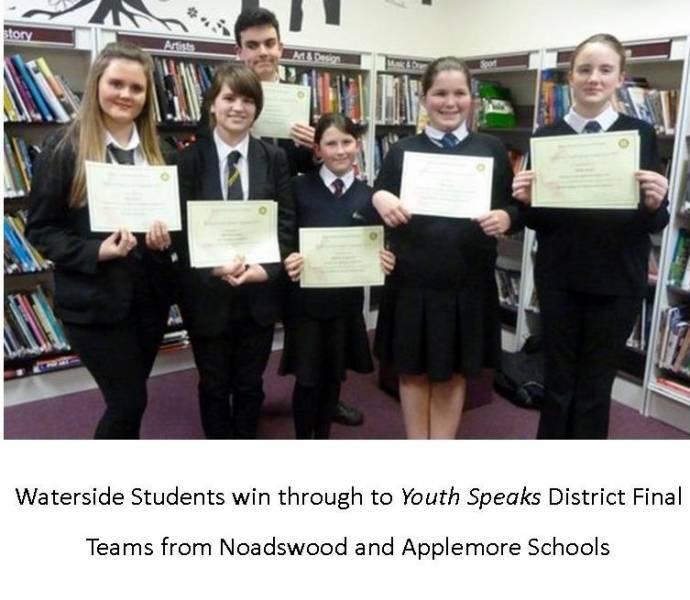 Photo from left Sophie Boyes, Ellen Cole Bailey, James Semmens, Bethany Longworth, Molly Blay and Molly Smith.